The Gunslinger vs. The Man in Black. Does this rivalry mean anything to you? Hint: It has nothing to do with Johnny Cash or Smokey from Lost. If the answer is yes, the ensuing review of The Dark Tower will likely be worthless. You’ve already invested time in the inner-workings of Stephen King’s landmark eight-book series of the same name. After all the build-up and hype and casting musical chairs, that curiosity itch needs to be scratched. I understand. This is a message for everyone else: Do not pass go. Proceed directly to Detroit or Wind River. There’s nothing to see here. Actually, the big problem with The Dark Tower is that there’s too much to see here. A sprawling saga set in two universes over hundreds of years has been compressed to 95 rushed, semi-incoherent minutes. 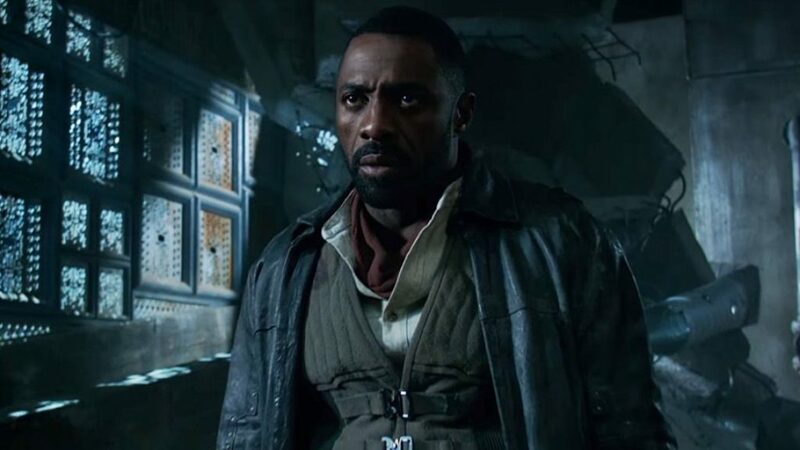 As such, a substantial sci-fi premise —a hero (Idris Elba) and a kid (Tom Taylor) team up to save Earth from a sorcerer (Matthew McConaughey) — has the dramatic heft of a paper cut. Allegedly important characters, human or otherwise, whiz by without taking a breath (or, they take their last breath without making an impression). And yet, a short running time can’t stop the clock on leaden dialogue, cheap-looking effects and hammy performances. For the love of The Matrix, somebody please put a stop to the slo-mo flying bullets! I frantically scribbled notes during the screening because mass amounts of back story unreeled at a furious pace. I think this is the gist: A “Dark Tower” is the center point of the universe that separates Earth from blackness. If the tower falls, the demons come in. Only certain kids can destroy it, that is if they penetrate their psychic minds. Young Jake, outcast and New York City resident, is one of these kids. He has dreams of a gunslinger battling an evil man dressed in black hell-bent on attacking Earth. He sketches out these vivid visions and posts them on his bedroom walls. His mom and mean stepdad think he’s just projecting trauma due to the death of his firefighter father. They want him institutionalized. Demons masked as humans are onto him, though, and are fully aware of his special gifts. They want him dead. Jake is too smart for that. He finds a magic blue-lit portal and escapes to a place called Middle Earth. Wait, that’s not right. It’s called Mid-World. It’s an ecosystem that kinda resembles Middle Earth. That’s where he finds Roland Dechain (Elba), the last gunslinger. Weary Roland has spent decades pursuing Walter (McConaughey), also known as the man in black. (Despite the ominous name, gunslingers work as peacekeepers.) The MIB has the power to take the form of other humans and kill on the spot. If he walks up to a person and says “stop breathing,” that person will fall to the ground and die. Roland and Jake need to track down the real Walter and . . . 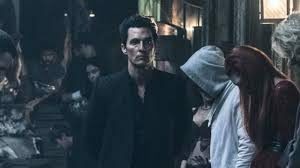 If The Dark Tower were a TV show (and a series is indeed in the works), this would mark the end of episode 1. Here we get the entire run and the cast reunion. Based on the fan frenzy, this rivalry was supposed to rank up there with Luke Skywalker vs. Darth Vader. But Elba and McConaughey barely share screen time, and they’re unable to convey their deep-rooted history of battling each other. What a shame, given that Elba was overdue for a lead performance in a blockbuster. He brings gravitas to the role, but a great actor can’t put a shine on shoddy raw material. Some of his dialogue is laughable. McConaughey does him no favors. Between his GQ appearance (slicked-back hair and open-chested tailored black shirt) and drawling psychobabble (“death always wins, that’s the deal”), the Oscar winner plays the role as if he’s filming an extended version of a Lincoln car commercial. He’s just not credible as a legendary villain and nemesis. Now that the McConnaissance has crested, I worry that he’s veering into self-parody. (That’s a post for another time.) Christian Bale was the original frontrunner to play the Man in Black; no doubt he would have put a more sinister and enigmatic spin on the part. Chalk it up to what might have been. As with any King adaptation, books could be written on all the differences between the novel and the movie. Surely I missed Easter eggs. And I could do a Google search on “Dark Tower movie plot” and receive dozens of Cliff’s Notes-like explanations that would fill in the some of the blanks. I refuse to read them on principle. If a film requires supplementary information, something has gone terribly wrong. It needs to stand on its own. The Dark Tower might as well crumble into one of those magical portals.